Today is the first day of my Gemalto Contactless Challenge and I almost did not go contactless. It isn't so much as not wanting to go contactless, but being prevented to do so. Nevertheless, after a rocky start, I was soon swiping like a pro. My typical day begins at St Albans. This is where I live. The main railway station is manned by First Capital Connect, also known as one of the worst railway network in Britain, but never mind that. Here, anyone who doesn't own a season ticket but wishes to go into London has to buy their tickets from either the few self service machines dotted around, which does not accept contactless payment yet. Mind you, with the daily peak time travelcard costing more than £20 so you wouldn't be able to pay using contactless anyway. So I went to the counter and asked the gentleman behind if they accept contactless payment. Blank stares. Uhm, wireless payment, NFC etc.? What, he quipped? Finally, I whipped out the phone and waved it around the payment terminal (I will be doing this a lot this week). His facial expression changes from confusion to realisation - I guess he's probably seen one of those Galaxy S III ads - and with a firm 'No', that was that. 'Kay. Soko Coffee operates just outside platform four exit, which I use probably 99% of the time. It is an independent mobile coffee kiosk operated from a modified scooter fitted with an espresso machine. Oh, and they serve gorgeous coffee. Unfortunately they do not accept NFC payment. To be fair to Charlie (the owner), the amount of delays we experience at St Albans station meant that most of us who do bother to queue for Soko's amazing flat whites will have all the time in the world to fish for change. WHSmith and AMT Coffee do operate from inside the station on the other entrance which I only use that other 1% of the time. These two stores do accept contactless payment (at least their PR claims so), so I will be making my way the longer way sometime this week. A small coffee shop called Pumpkin Cafe operates on platform one of the station and this was where I made my first ever purchase using contactless payment. Hurrah and progress! Incidentally, this small railway station coffee shop is the only store I have stumbled that has a clear, large and informative sign indicating that contactless is an acceptable form of payment. Later in the day, I visited the Electric Coffee Co in Ealing Broadway for a quick meeting. Unfortunately, while this was a brick and mortar shop, they do not yet accept contactless payment, which is a shame as coffee shops are the perfect venue for this technology to flourish. Coffee shops tends to be frequented by early adopters, who are probably in a hurry (though a good cup of coffee takes time to make) and coffee prices are well under the £15/20 limit. These days I carry coins purely to spend in coffee shops, and if all coffee shops were to adopt contactless payment, I would see it as the extinction of loose change. By now I was getting slightly hungry, and thought I could do with a late lunch. I decided to pay the YO! Sushi branch at St Pancras International Station a visit. I notice Ewan is highly competitive on twitter and bagging YO! Sushi would give me 10 points! In any case, if there is a chain that would accept contactless payment, it must be this surely! They are massive - in fact I call them the McDonald's and Starbucks of sushi. No sign outside the restaurant claimed that they accept NFC, or indeed any form of plastic. I asked to speak with the manager, who kindly informed me that they have no idea what I was talking about! Large, clear and informative sign. How it should be done! Defeated and annoyed, I slugged on, determined to find a Krispy Kreme kiosk that will at least bag me 10 points. A quick search on Foursquare revealed that they have a kiosk in nearby Euston railway station. My destination set, I quickly made my way. I spotted a Post Office on Euston Road. Figuring that if the Post Office in St Albans has the means to enter the 21st century, the one right by the very railway station that welcomes European tourists must surely have also followed suit. By now I was slowly beginning to recognise the tell tale signs of a shop that does accept contactless payment. The clues are in the PDQ terminals. They tend to look all new and shiny, with a large screen. The ones at this Post Office looks as if they have been built in 1999! Sorry Gemalto, your postcard will have to wait but I promise when it arrives, it will be epic! I finally arrived at Euston where I was 100% certain the Krispy Kreme kiosk would accept my magic phone. After all, the Barclaycard website states that they do! Here there is absolutely no sign that they accept NFC or indeed even plastic. 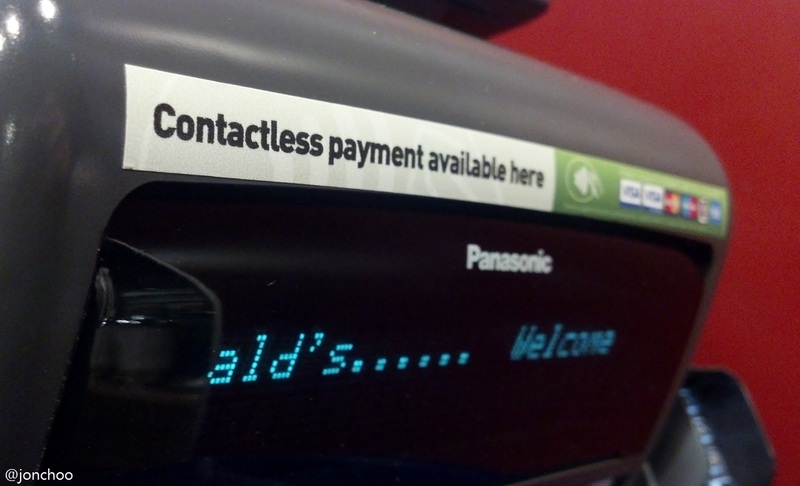 The payment terminal is hidden behind the counter. Careful not to order first, I walked up claiming to be a researcher, and after waving my phone like a mad man to indicate if they would accept such a contraption the four men behind the counter shook their heads in unison. Seriously. So not much luck so far today. I thought about buying some flowers for my partner, but as she is away in Norwich for the next two days I do not think she would appreciate that! 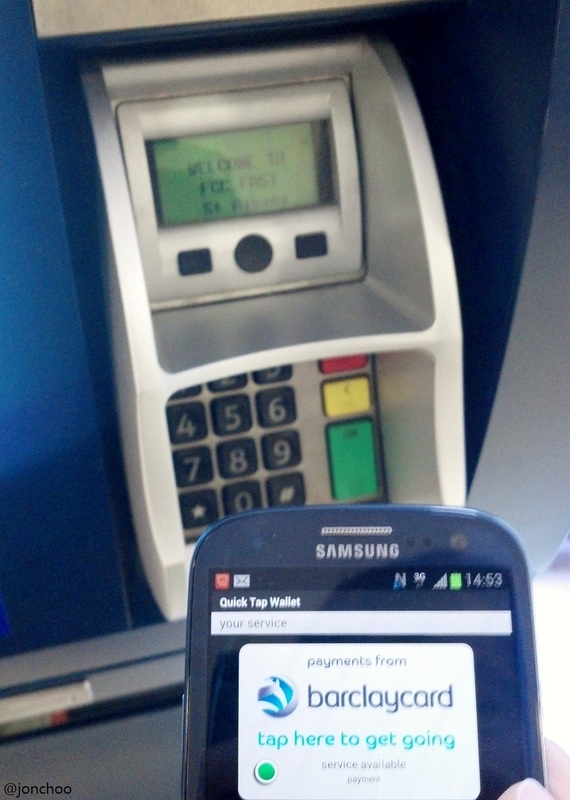 Luckily for me, an enterprising fellow on Twitter @rayleee challenged me to top up my mobile via NFC. Top up my mobile by paying with my mobile? This is as meta as you can get. 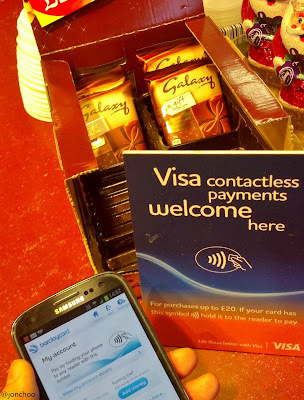 Vary not to be confident now, I strutted up towards a WHSmith looking for signs that they accept contactless. It was busy and I did not want to hold up the queue that will inevitably form behind me. Back in St Albans, realising that I have not got lunch, let alone dinner yet, and with the lady away, I reckon I could explore the town's shops and cafes. Unfortunately I forgot about St Albans' knack for shutting down almost everything by 5.30pm! By 6.45pm, the only store still open was the local Tesco and so it was the only store I could sneak in a TV dinner. Such is life living in a commuter town. 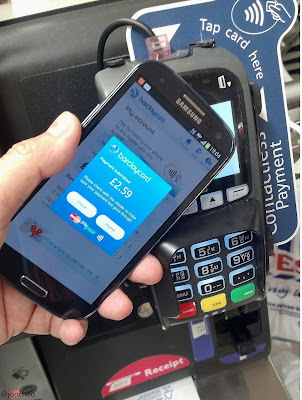 At least Tesco accepts contactless payment via their self service terminals, even if they have no signs on the entrance indicating so. Still, dinner for £2.59, a snip at this frugal times! 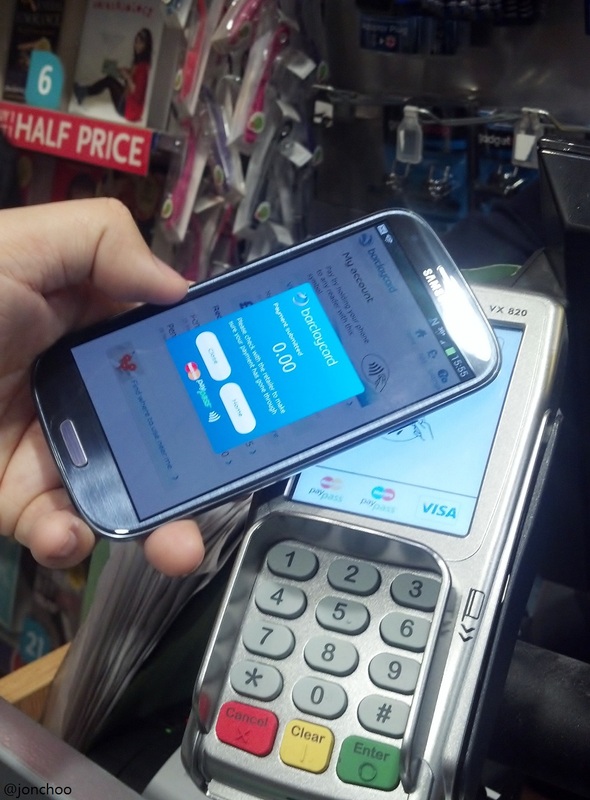 First contactless payment on a self service terminal. Hurrah! What did I learn today? Not much, but I at least I am now getting familiar with this payment method. 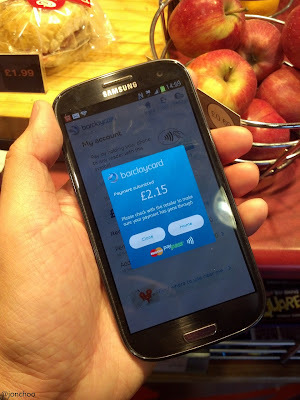 Do be careful about using the Barclaycards issued guide as your NFC gospel because the website is terribly outdated. It features stores that do not deserve on the list as well as missing those that do. 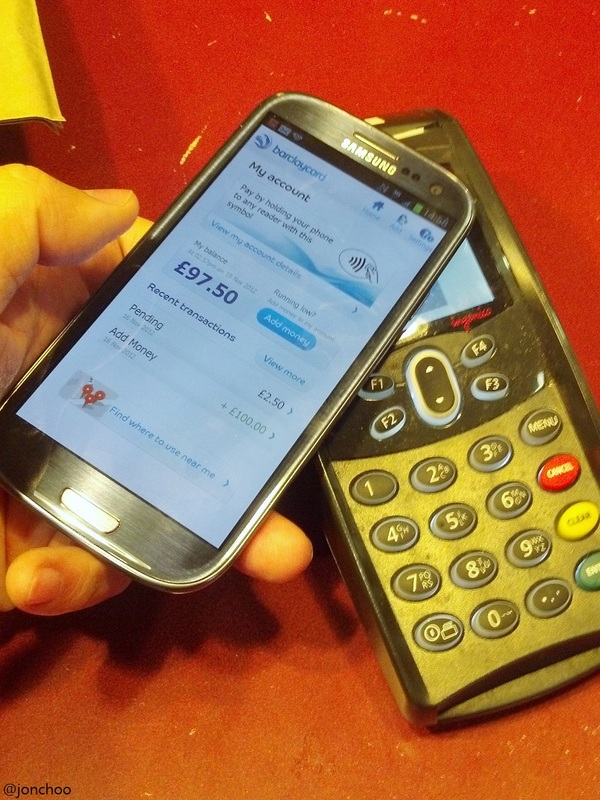 One thing I did learn is that more venues and retailers than I imagined are now using NFC but the technology hasn't gained widespread awareness and acceptance within customers and the people manning the tills themselves. I imagined a similar period of adjustment during the early days when chip & pin was introduced. As the week goes by I am quietly optimistic that I will be discovering more independent retailers who has accepted this convenient technology, and that initial feeling of rush when making a payment will be replaced by a sense of normality. (?) 10 Points - Wildcard: Spotted a new venue using NFC? Take advantage immediately and share your find online!